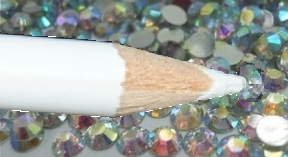 Bead, Pearl & Rhinestone Wax Picker Pencil Tool. Tired of trying to pick up small beads or loose rhinestones with your fingers? Well, this is the tool for you! This white wax filled pencil picker tool measures 7 inches and comes unsharpened; can be sharpened with any standard pencil sharpener. Great for nail art, small beads, loose pearls, rhinestones, gems, and crystals.